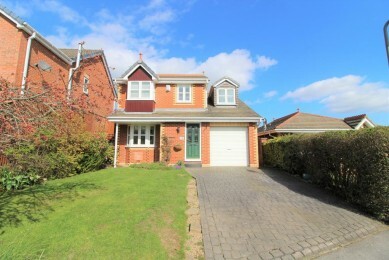 **LOCATION, LOCATION, LOCATION** Gates estates are pleased to present to the market this four bedroom detached property located in the sought after area of Silkstone Common. Having accommodation briefly comprising; living room, dining room, Conservatory, kitchen, cloakroom, 4 bedrooms, bathroom and integral garage. A welcoming space which provides access to the first floor, living room and cloakroom. A small cloakroom comprising of low flush WC, wash basin, double glazed opaque window, laminate flooring and gas central heating radiator. This well presented room has carpeted flooring, 2 radiators and a front facing double glazed bay window. There is a small chimney breast with gas feature fire and access through double doors to the dining room. Located to the rear of the property is this generously sized dining room. The flooring is carpeted and includes a central heating radiator and access through to the conservatory and Kitchen. Having a range of wall and base units with work surfaces which incorporates a stainless steel sink and drainer. There is plumbing for a dishwasher and also has an integrated oven, hob and extractor fan. There is a rear facing double glazed window looking out to the garden. Access is given to a storage cupboard located beneath the stairs and access to the utility room. A great sized room with a range of wall and base units. It also has plumbing for an automatic washing machine including a sink with drainer. Spacious and bright with the advantage of UPVC French doors leading out to the rear garden. It has tiled flooring. Access to the loft, four bedrooms and house bathroom. A front facing bedroom which has a radiator and double glazed, bay window. There is wood effect laminate flooring and walls are painted. There is also access to its very own en-suite with a shower cubicle, WC and wash basin. Located above the integral garage, this room spans the whole length of the garage and has the added advantage of dual aspect double glazed windows. A good sized double bedroom with double glazed windows overlooking the rear garden. The flooring is carpeted. Currently used as a study but can be used as a bedroom. The flooring is wood effect laminate and there is a double glazed window overlooking the front garden and a storage cupboard located over the stairs. Having a three piece suite in white comprising, bath with electric shower over, low flush wc and pedestal wash basin. There is a radiator and rear facing double glazed opaque window. A grassed lawn with concrete, paved effect driveway allowing 2 vehicles to park including access to the rear garden via lockable gate. To the rear and side is an enclosed garden area and separate lawn and patio area. The garden isn"t overlooked and is excellent for entertaining.